Per usual, I began this letter today by combing through free stock photos for blogs. 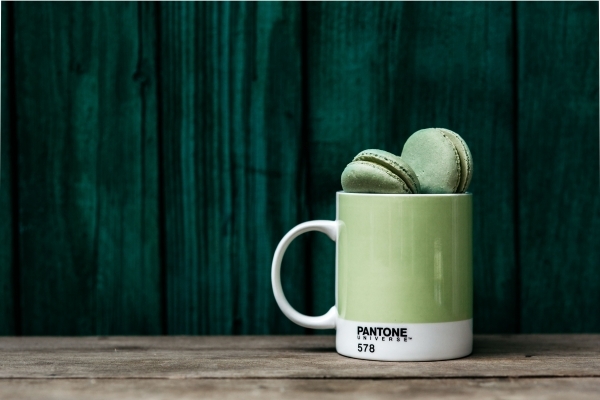 With no idea in mind… simply waiting to be taken by an image… I stumbled across this Pantone 578 mug. I spent many years operating an offset printing press and Pantone was the language I spoke and my lens on the world. Pantone is the company that offers a color matching system for the printing industry and each of their almost 2000 color chips is composed of a very specific recipe. I absolutely relished the time I spent mixing colors by weighing out glob after glob of mouthwatering colored inks, mixing them gently with a special spatula, and watching the perfection of subtle color come together. It was like invoking color and it was magical. If you had an eye for it, you could detect the difference in color between Pantone 578 and Pantone 577. Really (for instance, the cookies are closer to 577, can you see? There is a smidgen more blue. A teensy weensy bit more black). What in the world does this have to do with listening? Many of us have come to volunteer at the Listening Post through some mysterious tug. When we came across the LP, it touched us. Something in us moved toward it as if that ‘something’ inside us already recognized it and lo… we began serving as a listener even if nothing else in our life would have seemed to predict such a movement. But I’m beginning to suspect that there is quite a bit that lead up to our decision to commit to this deeply compelling service of ‘just listening’ to another. Even if you can chalk it up to your own personal value system – say, you value community service, or value kindness, or in general you like people – still… why ‘listening?’ Our service is very particular. I’m curious: What in your life prepared you for this particular form of service? When I take a close look at what I have done in life, how I have spent my time, what I have done for work… a pattern emerges that is uniquely mine. True for all of us, even if we see ourselves following in someone else’s footsteps. For we can only do that, the way we can do it. Languaging this feels strange, but we can’t actually copy anyone. Even if we copy another, we still, by default, do it as only we can. So. What are the unexpected aspects of your own life that link up with your desire to serve as a listener? I seem to go for work that values a subtle discernment, fine motor skills, make adjustments or corrections on the fly (like running a press with a thousand moving parts). That is the way I’m built and the way I’m built picked listening. In this moment, I see ‘fine motor skills’ as equivalent with a willingness to pay close attention with unending curiosity and making adjustments on the fly is the way I am present with each guest exactly as they are in the moment, and the next moment, and the moment after that. For the sheer joy of it, what are the personal qualities you have always had, that no one had to teach you, that ended up being the very qualities that foster your particular way of listening? I would love to hear your answer!